FENTON, Mich. -- Richard Canever's friends thought he was nuts when he spent $3.3 million to renovate his Chevrolet store in 2008, on the eve of the worst auto recession in 30 years. For nearly two years, he thought they might be right. Today, though, Canever is glad he took the plunge. His dealership, Vic Canever Chevrolet, is a prototype for the massive General Motors Co. store renovation effort that is expected to include 1,000 of the 4,500 GM dealerships by year end. And vehicle sales have rebounded nicely, Canever said, with several hot models such as the Equinox crossover, heavy-duty pickups and, potentially, the Cruze compact, which replaced the Cobalt in September. Canever said he would hate to have the distraction of construction now, as busy as he is, and with bank lending still tough to get. "I'm glad my renovations are done and over with," he said. Canever, who will turn 57 this month, got into the car business in 1969 when his father, Vic, opened the store in this city just south of Flint. 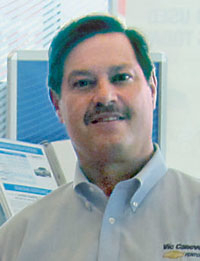 Richard Canever has owned and operated the store since 1987. For years, selling Chevrolets was a breeze. The numerous GM assembly and parts plants in Flint sent a steady stream of workers to the store armed with the GM employee discount for up to 18 percent off the sticker price, Canever said. In the halcyon 1990s, it wasn't unusual for the store to sell 125 new vehicles a month, or 1,500 a year. Sales were still rolling past 2000. By early 2007, it was clear to Canever that he needed to upgrade the showroom, service bays and customer amenities to keep business flowing. As it turned out, GM had a store upgrade program just under way called Image 21. Canever qualified for $360,000 in Chevrolet incentives, based on his sales volume. Then he persuaded Chevrolet to throw in another $360,000. He financed the rest. He added a beautiful atrium to the showroom, expanded and put ceramic tile in the service write-up area, expanded the offices, put in a specified Chevrolet entryway, painted everything and opened a customer cafe with a neon Chevy sign. But the $28,500 monthly payment on the dealership's GMAC loan became onerous in late 2008 when Lehman Brothers collapsed and a national credit freeze sent vehicle sales into a tailspin. By June, GM was in bankruptcy. And Flint -- already ground zero for GM's factory closures and job cuts -- suffered another wave of misery. Almost overnight, Canever's mood sank. In 2009 new-vehicle sales fell to 772 from 971 in 2008 and 997 in 2007. "Every night, I second-guessed" the costly decision to renovate, he says. "I lost lots of sleep." The store survived by cutting, says General Manager Mark Janowiecki. Head count was cut from 65 to 54, mostly by laying off support staff and assistant department managers, he says. The store also renegotiated with vendors, getting price cuts on gasoline, uniform rentals and dozens of items. The dealership also added an option for a catastrophic-only medical plan, Janowiecki says, allowing employees to cut their co-pays. Canever says the store expects to sell about 830 new vehicles this year. Two recent GM dealer incentive programs are helping the dealership more than meet its loan, Canever says. One program, Essential Brand Elements, pays the dealership about $481 per vehicle for meeting standards in customer retention outreach, software, employee training and quality of facilities, Canever says. From the program's launch in October 2009 through mid-September, the store received $367,000 in Essential Brand Elements incentive money, he says. Chevrolet's Standards for Excellence program, which rewards dealers for additional units sold per quarter compared with the year-earlier period, nets the dealership $65,000 a quarter, Canever says. Qualifying for the Essential Brand Elements payments is one of the carrots for dealers to upgrade stores to Chevrolet standards, Canever says. He gets weekly visitors from other stores, he says, because Chevrolet has designated his dealership as a prototype store for the latest changes. Colleen Haesler, Chevrolet's director of sales operations, says the facilities upgrades are designed to show Chevrolet vehicles in the best possible light and improve the buying experience for consumers. Of the 1,000 GM dealers that will be enrolled in the program this year, Haesler says, 700 are Chevrolet dealers. Canever says it's nice to be a prototype, but it's even nicer to have the spending behind him. "At the time, it felt like Russian roulette, but we're glad we did it."